Since 2015, Santiago de Chile has been home to the Center for Solar Energy Technology (Centro para Tecnologías en Energía Solar – CSET) of the Fraunhofer Chile Research Foundation. 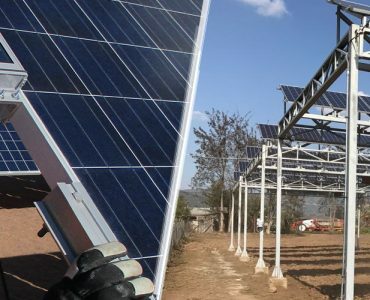 It was founded as an Excellence Center for solar energy by the Chilean concession and economic development authority Corfo in order to promote the further expansion of solar activities in Chile. 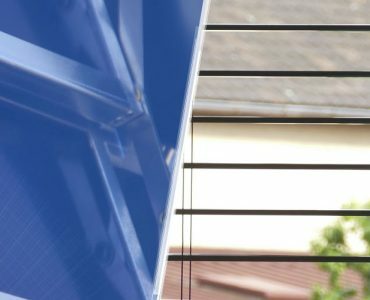 Under the direction of Frank Dinter, who took over as Managing Director at the beginning of 2018, some 25 employees are conducting research primarily on photovoltaic systems and various solar thermal applications. Potential of renewable energies in Chile. PV, CSP, wind power (eólico) and water power (hidroeléctrica). Chile, with its north-south extension of about 4,300km, has diverse climate zones. With regard to the energy sector, the north of Chile with the Atacama Desert is especially attractive. Due to the geographical conditions, the highest solar radiation in the world is recorded there. Up to 3,400kWh/m²a of direct normal radiation per year can be measured in the world’s driest desert. The theoretical potential in Chile is 1,640GW for photovoltaics, 40.5GW for wind energy, 553GW for CSP and 12.5GW for hydropower. With such a solar potential, northern Chile could supply the whole country with renewable energies and even export electricity to neighboring countries. 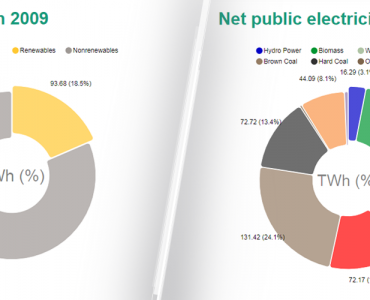 In August 2018, the share of installed capacity accounted for by renewable energies was 19 percent, with 47 percent being generated by photovoltaic systems, 31 percent by wind turbines and 11 percent by biomass and mini hydroelectric power plants, respectively. According to the Energy Ministry, the goal is to increase the share of renewable energies to 60 percent by 2035. In order to achieve this goal, the transmission capacity in the country must be increased and storage systems expanded. 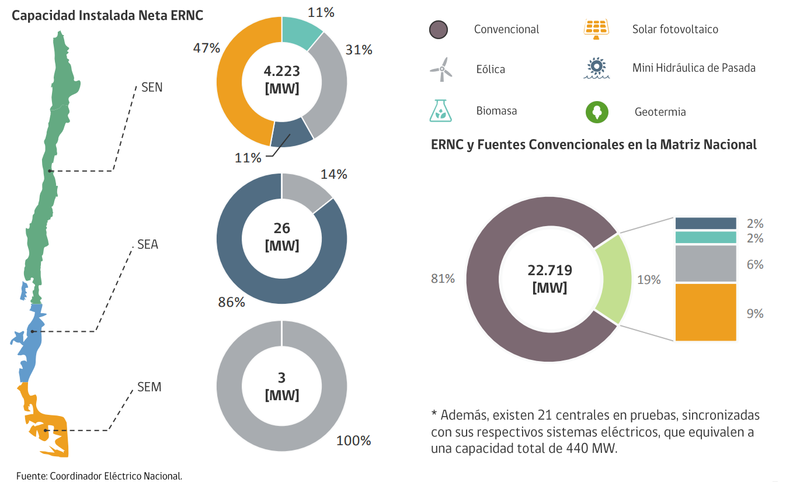 Installed capacity of renewable energies in Chile. As the proportion of PV used for power supply increases, batteries will become increasingly important in the future. Chile, the second largest lithium producer in the world, is pleased with this development. Half of the lithium reserves that can be mined are located in Chile in the salt flats of the Atacama Desert. Below the dried salt layer, there is a lithium chloride brine which is pumped in reservoirs at the surface. There the water evaporates and the crystallized concentrate is dried by the sun (more information). If Chile not only wanted to promote the raw material but also had an interest in establishing a processing industry, a new industry could be developed. Since 2018, Frank Dinter is the new director of the Fraunhofer Center for Solar Energy Technologies CSET within the Fraunhofer Chile Research Foundation. Fraunhofer CSET was founded in 2015 and is doing application orientated research in the field of solar power in Chile. Marlene Steppeler is studying in the Bachelor’s Programme »Renewable Energies« at the technical university in Cologne. At the moment she is doing an internship at the Fraunhofer Center for Solar Energy Technologies CSET in the department for photovoltaic systems. Fraunhofer CSET was founded in 2015 and is doing application orientated research in the field of solar power in Chile.